It begins very early, perhaps with the first spark of life; relationship, connection, a drive to resonate with life and especially with forms just like us. We call it family, bonding, attachment. But we get so confused, all that chattering in our head and the obsession that others must hear those voices too. We want to be seen, felt, understood and appreciated. So we tell them, all the time. That is one side of the communion dynamic, sharing who we are this moment. The other side is observing and listening. One side has a need to be known and the other has a need to know. These two sides of the communication coin are very different. From time to time when an extraordinary topic surfaces, one that impacts all of us I post them to Touch the Future’s home page. Architects and Engineers for Truth about 911. Bill Moyer on ALEC, the way corporations manipulate state legislation. I love social media (sometimes) because it helps us see that we are not alone and crazy. Others are as concerned as we are. What we need to do, each and every one is to pick a cause, get upset and get involved. Each of us must become pro-activists, passionate and skilled at creating nonviolently the world we know is possible, one driven not by books, religious-political propaganda and dogma, not by fear and greed, by the flowering of innate human kindness, creativity and values. 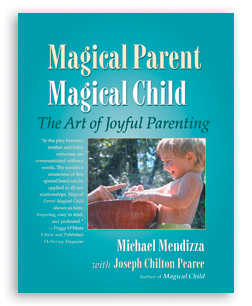 I recently released the third edition of Magical Parent – Magical Child co-authored with Joseph Chilton Pearce. If you have not read it – I encourage you to do so now. Joseph Chilton Pearce added depth to this basic insight when he described the ‘model imperative’ in his bestselling book, The Magical Child. Each of us represents vast capacities, more and greater than ever imagined. The awakening and development of each capacity requires a model-environment to serve as a catalyst for that potential’s opening and development. No model – no development. That is the ‘model imperative’. An educator used Magical Parent – Magical Child as the text for her class. She asked a few probing questions. You may find them of interest.